Yotam Ottolenghi—an Israeli born in Jerusalem—owns five restaurants in London and contributes flavoursome recipes to the Guardian on Saturdays, with unusual Middle Eastern taste twists. Not a great looker--but the taste...! 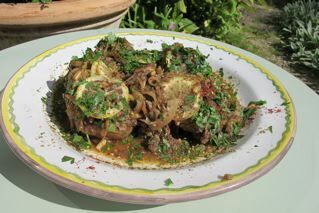 Ottolenghi’s Chicken is his version of the traditional Palestinian dish, M’sakhan. It is delicately flavoured with soft spices like cinnamon, allspice, and sharpened a little with sumac [dark red and lemony], enhanced with thin slices of lemon and onion–delicious to bite into–and finished off with za’atar–which is sesame seeds in a mix with oregano, thyme and other herbs. The chicken pieces are marinaded overnight in these gentle flavours, then roasted for 40 minutes. Garlicky yogurt sauce & Moroccan bread went well with it at the book launch. For diabetics, better to substitute whole-wheat brown pita bread or brown Basmati rice. Combine the first 11 ingredients in a bowl and mix well together. Let this marinade, covered, in the fridge–preferably overnight. 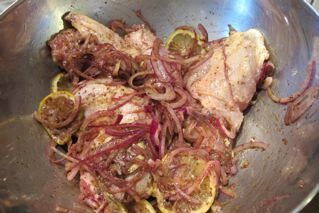 Lay the chicken pieces, skin side up, in a roasting pan and cover them with the lemon and onion marinade. Roast in the oven for 35 to 40 minutes–the juices should run clear when you pierce a leg piece. In a small frying pan gently dry roast the pine nuts. Sprinkle them over the chicken and present the dish to the “table” before serving and enjoy the “oohs!” and “aahs!”. Scatter over some chopped parsley to finish, for colour, if you have some on hand. Whisk all ingredients together into a smooth sauce. As so much of this dish can be prepared beforehand it is a useful dish for company. Two chickens roasted together will give you enough to feed 10 people. Wow! That sounds really scrummy. The recipe reminds of a chicken dish that was presented to me by a Persian (sorry showing my age – Iranian) friend about 40 years ago. Will have to try your recipe to see if my taste buds remember it!!! Loving the cookery book, Robin. Will explode if I eat any mor Courgette Muffins!!! We had them last night too!! PS Apologies for the typo’s – it is 2 am ….I should give up!!! !